When I was fourteen years old, I fell down a waterfall. This wasn’t (consciously anyway) the reason I chose this photograph as the cover pic for the Mindwise Facebook page… but perhaps it played a part at some level. I think though, that it is an arresting image for most people. Perhaps before you read on, you might pause and consider what you see when you look at it. (Let me know in the Comments section below if you like). For me, its central story is one of relaxed focus in the face of much that might induce otherwise! “Focussed” because in that situation you cannot afford not to be; and “relaxed” because in that situation you cannot afford not to be! Too much anxious dither, too much being distracted by possible future scenarios, and you’re gone! Yet at the same time, not enough attention on future possibilities, and your fate is likewise pretty well sealed!! Isn’t this what we all deal with on various levels every day? The stakes may not be so tangible – yet within the network of associations that makes up our mind, many things can feel a matter of life and death. Social failure is not death; but when we were tiny we desperately needed to know that we were loved and wanted, enough to protect our survival: we were not , after all, able to keep ourselves safe much at all. And even as adults, we are deeply social beings, ultimately unable to survive for long unless we are accepted as members of a tribe (even Bear Gryllis only tackles short stints!). No wonder a glare, a frown, the lack of a smile, can feel upsetting; and being trolled or bullied can keep us awake by night and avoiding work or school by day. Or not getting a promotion can seem to rock us at the foundations where success at work is the modern day equivalent of being able to bring back enough food from the hunt for the family to survive. Our DNA doesn’t understand that there are social safety nets, and the primitive modes of our nervous system can experience threat just the same. So we are navigating issues that by association are a kind of life-and-death. 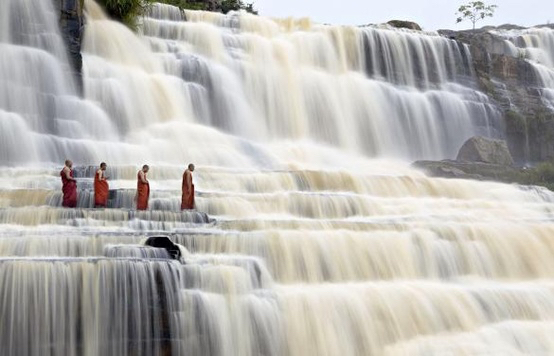 And just like the monks on the waterfall, we need a bit of attention on what could possibly go wrong, along with quite a lot of attention on grounding ourselves in the present moment (the placement of a foot on just the right place, for example). My waterfall was not that big. But it was nonetheless not one that anybody would want to fall down: the water landed onto a large sloping rock before spilling down into a deep pool. Remembering back, I would say I was a little too relaxed at the top of my waterfall: a little too foolhardy, as we often are in our teens, unaware of how ever-present is the possibility of death. But I was also a bit too preoccupied with my teenage angst, my head wrapped into a little piece of miserable thinking that absorbed my attention, and left too little focus on present time contingencies. I was perched too near the edge, and I reached out for a leaf… I was not paying quite enough attention to my balance and centre of gravity in the present moment… oops!! I fell about seven metres, knocking my foot on the way. I remember thinking on my way down “This is it! I am about to die.” As I plunged into the pool, within the stupor of shock, the reflexes to breath at the right times somehow did their job. Somehow I clamoured to the side, where others pulled me out. A well-trained auto-pilot for staying afloat, and an instinct to move toward safety, took over. I could have gone on to develop a fear of all things waterfall. Or of heights. But I am happy to say, it went in as a lesson in caution without resulting in so much caution that I missed out on the delights of swimming (one of life’s great pleasures for me). Four years later I was to begin a life-long practice of yoga. I was to learn methods that allowed me to practice daily this balance between focussed attention and serene relaxation. When you look at a yoga asana, you might not see that. Maybe you see flexibility; maybe you see exercise; maybe you see a body shape. But inside the mind of a yogi, a habit of effortless effort is being cultivated. I think you can see that with these monks, can’t you?